This study has shown for the first time that the administration of albumin at high doses has an immunomodulatory effect both in the short (INFECIR-2) and long-term (Pilot-PRECIOSA) in patients with decompensated cirrhosis. The researchers of the EF-Clif have also confirmed the unstable character of the circulatory dysfunction in patients with decompensated cirrhosis and that the administration of albumin at high doses improves this instability and cardiac function. The research was based on two investigations, the Pilot-PRECIOSA study, sponsored by Grifols, and the INFECIR-2 RCT sponsored by the Fundació Clinic. Twenty-two institutions from 7 European countries participated in these studies. These findings open the door to new research on the mechanisms explaining the beneficial effects of albumin in cirrhosis and on the use of albumin treatment in critically ill patients with severe sepsis. Prolonged administration of high doses of albumin in a group of patients with decompensated cirrhosis was associated with a significant attenuation of the systemic inflammation chronically present in this type of patients. This immunomodulatory effect of albumin was validated in a second group of patients with decompensated cirrhosis. These are the main conclusions of the study promoted by the European Foundation for the Study of Chronic Liver Failure (EF-Clif), which has just been published in Gastroenterology1, the official journal of the American Gastroenterological Association. Cirrhosis is a chronic disease affecting the liver and the extrahepatic organs, and systemic inflammation is thought to be the main mechanism linking the diseased liver and the impairment on the function of the kidneys, brain, heart, circulation and other organs/systems. The main objective of the study performed by the EF-Clif investigators was to assess if albumin treatment improves systemic inflammation and if this effect is associated with improvement in cardiovascular function. Short term albumin treatment is the most common therapeutic approach in patients with decompensated cirrhosis. It is indicated for the prevention of paracentesis induced circulatory disfunction and for renal failure associated with bacterial infections, and in the treatment of hepatorenal syndrome. 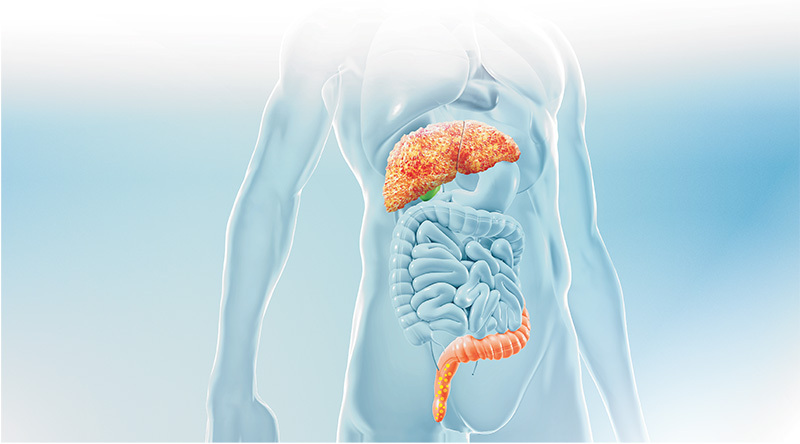 The recently published ANSWER study showed beneficial effects of long-term albumin treatment in the clinical course and survival of patients with decompensated cirrhosis. The investigation was based in the Pilot-PRECIOSA study, a proof-of-concept, open- label, multicenter, non-randomized, prospective, phase IV, safety, and dosage- exploratory investigation in 18 patients with decompensated cirrhosis, promoted by Grifols. Patients received low (1g/kg body weight every 2 weeks) or high dose (1.5g/kg body weight every week) for three months. The validation of the results obtained in the Pilot-PRECIOSA study was performed in a large series of patients with decompensated cirrhosis and bacterial infections, included in the INFECIR-2 study, a randomized controlled trial comparing the effects of antibiotics alone versus antibiotics plus albumin (1.5g/kg body weight at infection diagnosis and 1g/kg body weight at the 3rd day) on hospital survival, promoted by the Fundació Clínic. Systemic inflammation was investigated by assessing a large set of inflammatory cytokines and chemokines and other inflammation markers in both studies. Cardiocirculatory function was evaluated by assessing cardiovascular hemodynamics and plasma renin concentration (a marker of effective blood volume) in patients included the Pilot-PRECIOSA study. High, but not low, albumin dosage in the study group was associated with normalization in plasma albumin concentration, attenuation of systemic inflammation, and improvement on cardiocirculatory function, as indicated by a stabilization of plasma renin concentration, and an increase in left ventricular function. The immunomodulatory effect on systemic inflammation was confirmed in patients included in the INFECIR-2 study. The research team has been led by Dr. Javier Fernández, clinical coordinator of the EF- Clif EASL Chair and head of the Intensive Care Unit of the Clinical Institute of Digestive and Metabolic Diseases (ICMDM) and by Dr. Joan Clària, research coordinator of the EF-Clif Grifols Chair and senior consultant in the Service of Biochemistry and Molecular Genetics, both at the Hospital Clinic (Barcelona). The Pilot-PRECIOSA study has been carried out in close collaboration with the Grifols Clinical Trials Department. The investigators conclude that long-term high-dose albumin treatment attenuates systemic inflammation and improves cardiovascular function, and that this may underlie the beneficial effects of albumin treatment in patients with cirrhosis. They also conclude that these findings open a new research area on albumin treatment in cirrhosis and its potential use in other diseases associated with acute systemic inflammation and multi- organ failure such as severe sepsis. The European Foundation for the Study of Chronic Liver Failure (EF Clif) is a private, non-profit foundation whose mission is to promote the study and research on chronic liver failure and thus contribute to improve both the quality of life and the survival of patients with cirrhosis. 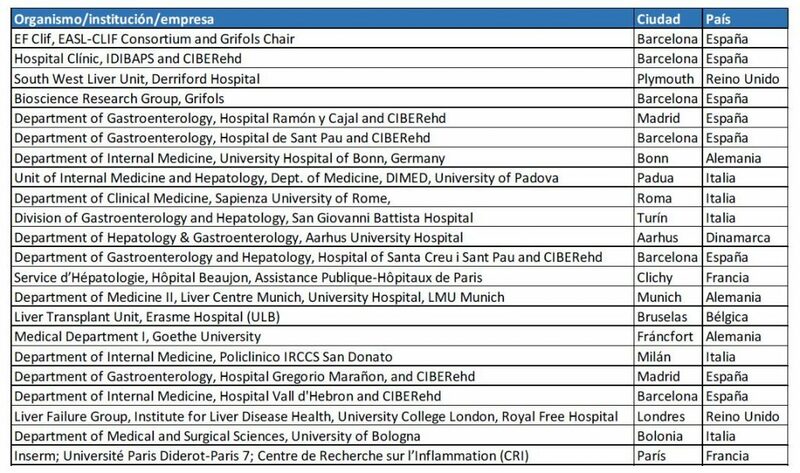 The EF Clif was born in 2015 to support the research work carried out by the European Consortium for the Study of Chronic Liver Disease (EASL-Clif Consortium), a research network composed of more than 100 European university hospitals and 200 clinical researchers. In 2013, the Consortium described a new syndrome: Acute Chronic Liver Failure (ACLF), which is the most frequent cause of death in cirrhosis. Currently, the research activity of the EF Clif is conducted through two chairs: the EASL-Clif Chair, to promote observational, physiopathological and therapeutic studies through the network of hospitals of the EASL-Clif Consortium; and the Grifols Chair, which promotes the development of translational research projects with the creation of a network of centers throughout Europe: The European Network for Translational Research in Chronic Liver Failure (ENTR-CLIF).